It probably isn’t news to you that different cultures make their own associations with different colors. Take purple, for instance. In Japan this color signifies wealth and power. In Ukraine and Egypt, it signifies faith, patience, and trust, whereas in Thailand it’s a mourning color worn by widows. For the marketer, this inconsistency of color perceptions can have implications for how your brand is received by the various markets in which you operate. McDonald’s takes this so seriously that it reviews its brand colors separately for each market it operates in. But don’t be fooled into thinking colors are perceived completely differently in every single culture. Perceptions of color can also be strikingly pan-cultural. This stunning visualization from Information is Beautiful indicates that cultures tend to hold more color associations in common than literature on this topic usually suggests. 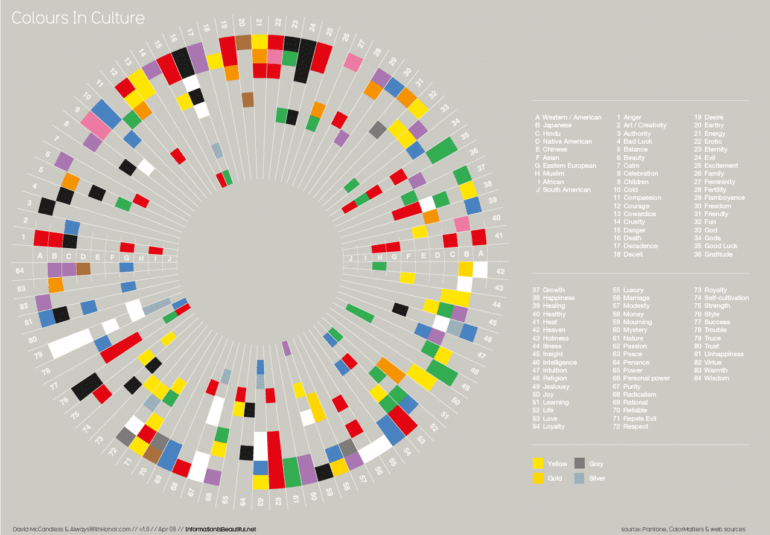 For example, in this visualization it’s clear that red is strongly associated with the emotion of passion (number 62) across multiple cultures. Of course, it also has different meanings that are more unique to specific cultures. In China and India, red is a wedding color. In South Africa, it’s one of mourning. So red is a color associated with times of great emotion across multiple cultures, although the specific life events (marriage and death) are rather different in nature. What also emerges from studying color and culture is that human ability to perceive color – and our tonal preferences – can be influenced by a surprising number of factors including our age, gender, and language background. In one study, people from four cultures (Japan, China, South Korea and the USA) were asked to make word associations for eight colors. The study revealed both similarities and differences in the associations participants made between words and colors. Across all the four cultures, the subjects associated blue with high quality and red with love. Consistently across all four cultures, black was seen as both expensive and powerful. In the three Asian cultures, purple was seen as expensive but for US participants the opposite was true; purple was seen as cheap. This seems to reveal color perceptions can have much in common between cultures, as well as some striking differences. As a marketer, there isn’t any need to be intimidated just because a specific color can have different associations in different cultures. Research looking at how people in eight cultures liked various colors indicated that the colors blue, green and white were well liked across all the cultures surveyed, where these colors also had similar meanings for all participants. Red and black were similarly popular, despite having meanings that were very different across the various cultures. But color decisions are not trivial ones for brands to make. In the States, orange tends to be associated with inexpensive fast food. Color consultants advised a hot dog chain to incorporate a little orange into its branding. After this minor change, sales rose 7%. In a similar way, a lavatory cleaner changed its packaging from a pale blue and green to a white font on a dark background to imply strength and cleanliness. Sales increased by 40% after the change. Color is not a trivial matter when it comes to branding. It doesn’t seem to be the case that all cultures have the same sensitivity to color differences. It appears that our ability to perceive color may be defined by language, a defining part of our cultural identity. Not all concepts – and not all colors – can be expressed in some languages. Two languages in Africa – the Shona language in Zimbabwe and the Boas language in Liberia – have no words to distinguish between red and orange. Language limitations can therefore act as a barrier to people perceiving different colors. Other cultures are more sensitive to subtleties of color variation: Eskimos use 17 different words describing white as it applies to slightly different snow conditions. In a similar way, people from East Asia groups tend to show greater sensitivity to the distinctions between colors in terms of their meanings, whilst people from North and South America make fewer distinctions between the colors and what they imply. In addition to one’s cultural background, it seems gender also seems to influence the extent of a person’s ability to perceive color. When a group of Nepalese people of both genders was asked to list the names of every color they could think of, results were strikingly different between men and women. 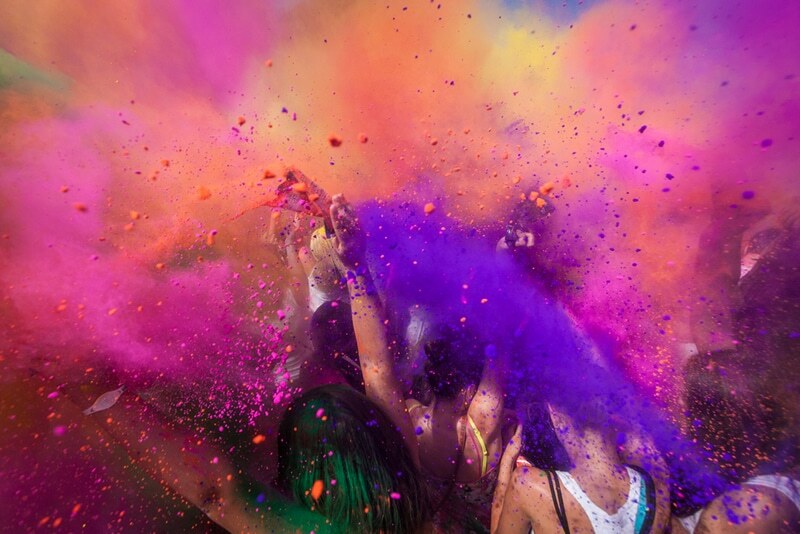 Female participants were consistently able to name more colors than male participants. A similar study looked into color identification and the vocabulary skills of a mixed-gender group of university students. When asked to name the colors of 21 colored chips, women in the group were able to recognize many more colors than men did. This ability of women to recognize a greater range of colors should perhaps be in kept in mind when designing websites and advertising aimed specifically at a female audience. Our age also seems to have bearing on our color preferences. At a young age, children much prefer color to shapes. After ages 3-6 this preference is reversed. Young children tend to be drawn to intense, strong, and warm colors but as they age color preferences cool off and their preference for softer tones emerges. Although color preferences involve many factors, children tend to gravitate towards bolder, warmer colors than adults. It seems this process doesn’t end after childhood and as we age, our preference for more subdued hues seems to become stronger. If you’re designing a website aimed at a specific age group, these traits should be kept in mind. There’s further cultural insight gained by the work of psychologist E.R. Jaensch, who found that people living in sunny climates tend to prefer warm, bright colors. People from less sunny climates favor a cooler, less saturated color palette. Certainly most travelers would associate cultures such as India and Africa with bright colorful art and clothing, and Scandinavian design brings to mind more neutral tones. Just because a culture might favor a certain color palette, your brand isn’t obliged to cater to this preference. 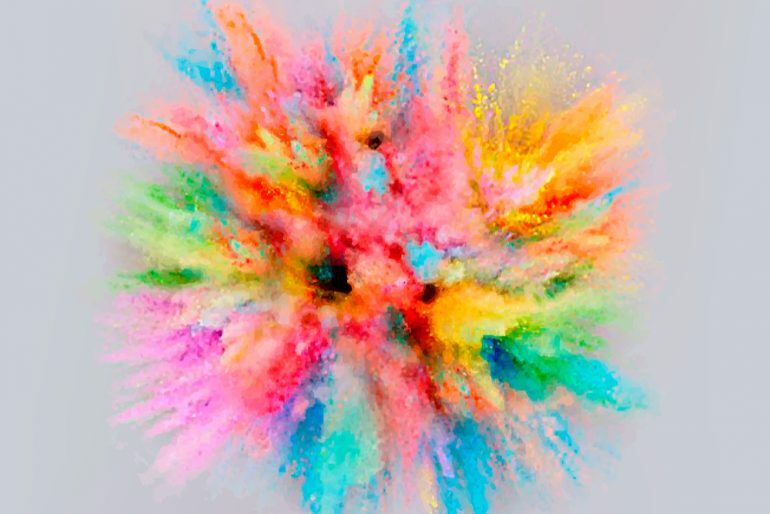 Using unconventional color choices is actually a good way for your brand to distinguish itself or even associate itself with values outside that particular culture. One such example is AfrikaRootz, a British company that imports baobab fruit from Africa to make children’s snacks. Whilst the British customer base may have a preference for neutrals in their own home and wardrobe, the branding for AfrikaRootz uses the warm tones this consumer base probably associates with Africa and the product’s origins. It’s the right decision for this particular brand – but that doesn’t necessarily mean it’s the right decision for yours. Companies looking to expand their operations internationally should pay close attention to the colors used in their branding and website design and work closely with a reputable transcreation agency to ensure that the right color palettes are used for the regions and customers being targeted.